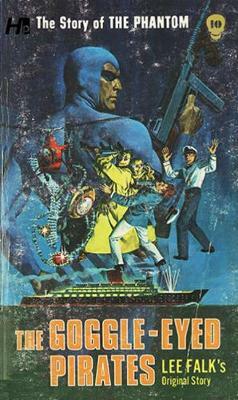 You are browsing: All The Phantom: The Complete Avon Novels: Volume #10: The Google-Eyed Pirates! For the first time ever, the Avon edition of The Phantom is back in print! Hermes Press is proud to announce that they will be publishing all fifteen pocket Avon books! This exciting installment, Volume 10 offers the classic Lee Falk tale: "Goggle-Eyed Pirates!" On a luxury liner in mid-ocean, a gang of weird pirates suddenly appears - as if out of nowhere. They rob the ship's vaults and passengers - then disappear just as mysteriously as they had come. How? Piracy - to the Phantom - is like a red cape to a bull. For centuries - since the first Phantom's father was killed by pirates - the Phantom has been the nemesis of pirates everywhere. Now, once more, the Phantom must meet that threat as he rallies to seek out and destroy the mysterious GOGGLE-EYED PIRATES.